Carpal tunnel syndrome (CTS) is a disease caused by compression of the median nerve passing through the wrist. Patients suffer from severe pain and paresthesis in the median nerve. Compression of the median nerve occurs, with prolonged working on keyboards (computer or laptop or music players) being one of the reasons along with others such as diabetes or rheumatoid arthritis. CTS research holds great promise for the patients as well as doctors for better medical treatment. The study has been carried out with an objective to analyze research progress based on the literature published on CTS during the last 35 years. The retrospective study has been carried out from the data indexed in SCOPUS multidisciplinary database from 1983 to 2017 (35 years). The study involves analysis of publication trends in terms of total articles, productive countries, institutions, journals, productive authors, most cited articles along with impact in terms of citation and h-Index. The SCOPUS database yielded 13187 articles during the study period. These articles were analyzed further for interpreting results. In the last 35 years, the number of scientific publications on CTS has been increasing with an annual growth rate of 9.86% per year. USA has been the most productive country. Literature pertaining to females is more than clinical studies involving males. Key Message: A literature analysis through bibliometric investigation of articles on carpal tunnel syndrome (CTS) was carried out for a period of 35 years. India ranked 18th with 1.44% of the global publication share. A large population around the globe working on computer or keyboards have been reported having CTS. This research is concerned with the CTS literature published from 1983 to 2017 obtained from SCOPUS, and studied to identify the trends in research publication in terms of various document types, annual growth, share of publication, citation growth, average citation per paper, most productive country, authors, journals, institutions, highly cited articles, total citations, as well as h-index. These factors were identified and compared for their research impact over a period of 35 years. Data for this study were obtained from the SCOPUS multidisciplinary database for the period from 1983 to 2017. The database was searched for the keywords “Carpal Tunnel Syndrome” in the title, abstract, and keywords fields. The impact factor (IF) of a journal was based on the Journal Citation Report 2017 (IF2017). The affiliated institution was taken from the corresponding address for each author. Collaboration among the authors was established based on the addresses of the authors. Collaborative research by the author or country was classified as either a 'single country' collaboration where all the authors' addresses were from the same country; or an 'international' collaboration where the authors' addresses were from more than one country. The citation count was taken as the number of citations scored by each article till December 2017. The h-Index was obtained from the SCOPUS database. There were 13187 documents during the period of study of 1983–2017. A total of 67.73% documents were published as journal articles followed by 14.22% as reviews, 7.36% as letters, 3.36% as conference papers, 3.28% as notes, 1.48% as editorials, 1.14% as short surveys, and 1.06% as book chapters. Erratum, conference reviews, and books had a share of less than 1% each. About 0.95% documents were not classified in any of the document types. Thirty-two languages were used for publishing 13187 documents on CTS; English was the most common mode of communication with 84.97% of the total articles published in the English language. [Figure 1] shows the growth of the research publications from 1983 to 2017. A total of 13187 articles showed a progressive increase in the number of articles published during the 35-year period. The correlation coefficient value was found to be 0.9253, which illustrates the continued growth of CTS literature. These 13187 articles accumulated a total of 2,06,266 citations till 2017. The articles published in 1998 scored the highest number of citations (11125 citations) with an Average Citation Per Paper (ACPP) of 100.23 citations. The articles published during 2003–2007 have the highest number of citations (42188 citations). The articles published between 1993 and 2009 had an average citation per paper of over 50. The overall ACPP was 15.64 during the study period. [Table 1] gives the characteristics of the growth of the publications studied in a time span of five years each. 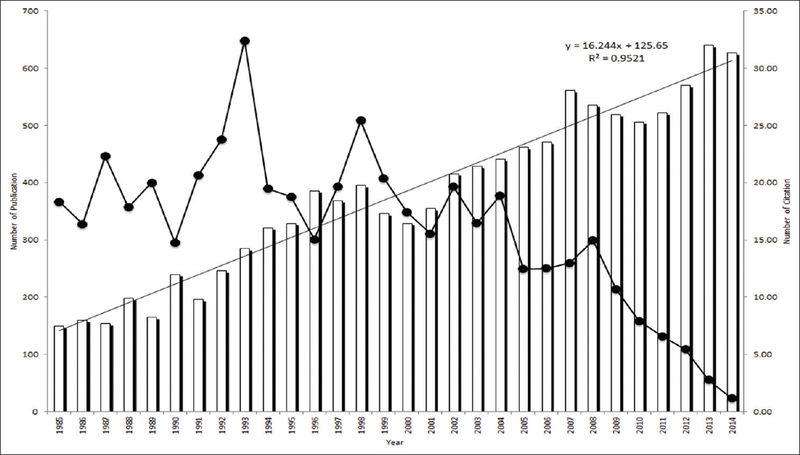 The highest percent growth rate of the literature in CTS was 6.14% from 1993 to 1997, followed by 5.34% from 1988 to 1992. The lowest growth rate was reported from 2013 to 2017 (0.69%). The literature on CTS grew with an overall growth rate of 9.86% during the study period. [Table 2] presents the contribution of the most productive countries that published more than 1% of total CTS articles. Seven indicators have been used to measure the research performance by a country. These include total publications, the share of publications and rank, independent single country publications (SCP) and rank, international collaboration publications (ICP) and rank, total citations (TC) and rank, average citation per paper (ACPP) and rank, and h-Index and rank. The top 21 countries contributing the most research were represented by two North American countries, ten European countries, and seven Asian countries, and one each from Australia and South America. USA ranked the first in terms of productive countries (4205 articles; 37.14% share), followed by UK (997 articles; 8.81%), and Turkey (576 articles; 5.09% share). The USA had the highest single country publications (3535 articles) followed by UK (377 articles) and Germany (564 articles). In terms of international collaborations, USA had the highest number of articles published as internationally collaborated studies (670 articles), followed by UK (377 articles), and Turkey (271 articles). Articles published in the USA had the highest citation count of 101206 with an ACPP of 24.07 citations (5th rank), followed by the UK with 20298 citations and an ACPP of 20.36 citations (8th rank) and Turkey with 14383 citations with an ACPP of 24.97 citations (3rd rank). 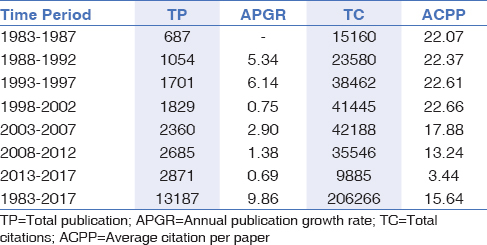 However, papers published from Taiwan ranked 1st in terms of average citation per paper with 42.90 citations, and a paper published from Iran ranked 2nd with ACPP of 26.01 citations. The qualitative parameter h-Index reflects the academic and scientific quality of researchers. The USA had the highest h-Index value of 123 and ranked first, the UK ranked 2nd (h-Index = 70), and Turkey ranked 3rd (h-Index = 56). India ranked 13th in terms of the total publication on CTS with 163 articles with a 1.44% global share. India ranked 13th in single country publications, 18th each in international collaboration publications, citation count, and h-index. One hundred and sixty-three papers from India accumulated a total of 1734 citations with an ACPP of 10.64 citations per paper. The author's contribution and research impact were analyzed based on the total publication (TP), total citation (TC), average citation per paper (ACPP), and h-Index. The frequency of the top seven authors in terms of total publication is presented in [Table 3] with more than 50 publications. Luca Podua has been found to be the most productive author with 103 articles, followed by P. C. Amadio (101 articles) and M. Mondelli (58 articles). Regarding the parameter of citation impact, Peter C. Amada was more impactful with the highest number of citations (2643 citations) followed by Luca Podua (2522 citations) and David M. Rempel (2392 citations). David M. Rempel had higher average citations per paper of 41.96 citations compared to all other authors. Assessing the impact on the parameter of h-Index, Luca Podua had the highest h-Index of 29, followed by David M. Rempel (h-Index = 28) and Peter C Amadio (h-Index = 27). One hundred and sixty-three papers published from India were contributed by 158 authors individually or in the collaboration. Latha Venkatraya Prabhu from Kasturba Medical College, Manipal (5 articles, 27 citations) and Sujatha D'Costa, Kasturba Medical College Manipal (4 articles, 25 citations) were the leading authors. The most cited articles published on CTS was analyzed based on the total number of citations scored by these articles till December 2017. Out of 13187 articles, 8365 (73.88%) articles have been cited at least one time. 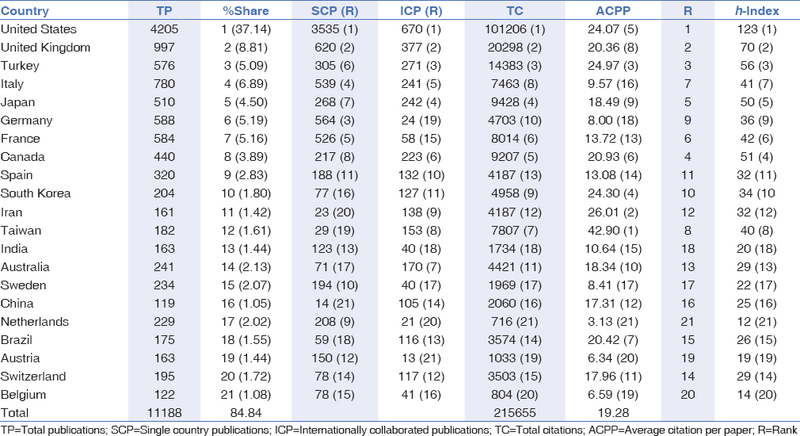 The top 10 most cited articles are given in [Table 4]. These 10 most cited articles are distributed throughout the study period starting from 1987 to 2008. The article by Lawrence et al., scored the highest citations (1989 citations) published in “Arthritis and Rheumatism” IF2017=8.955. The other article with second highest citations was a joint paper by Levine et al., (1993) that was cited 999 times, published in “Journal of Bone and Joint Surgery – American Volume” (IF2017=4.583). The third highest paper by P. J. Dyck (1993) was published in “Neurology” (IF2017=8.055). None of the Indian publications finds a place in the top 10 cited papers [Figure 2]a and [Figure 2]b. [Table 5] presents the 10 most productive journals publishing CTS research. These journals have shared a total of 18.31% (2073 articles) of the global output. Of these most productive journals, the “Journal of Hand Surgery- American Volume” published 895 articles on CTS (38.07% share; IF2017=1.776). The other productive journals included “Muscle and Nerve” (302 articles; IF2017=2.496), “Journal of Hand Surgery European Volume” (166 articles; IF2017=2.648), “Plastic and Reconstructive Surgery” (137 articles; IF2017=3.621), “Archives of Physical Medicine and Rehabilitation” (114 articles; IF2017=3.077), “Journal of Bone and Joint Surgery – American Volume” (125 articles; IF2017=4.583) “Handchirurgie Mikrochirurgie Plastische Chirurgie” (119 articles; IF2017=0.513), “American Journal of Industrial Medicine” (112 articles; IF2017=1.729), “Clinical Neurophysiology” (107 articles; IF2017=3.614), and “Hand Clinics” (106 articles; IF2017=1.171). It is interesting to note that all these journals are related to Hand Surgery or Neurology, which is the prime focus of the CTS disease. Historically, CTS disease can be traced back to 1933, but since 1960, CTS has become the most frequently diagnosed of the various peripheral compression-induced neuropathies. Different methodologies are adopted to assess the value of the journals publishing research articles in a given field. The parameters included in the assessment by different database aggregators provide a platform where authors can assess the value of the journal and submit their research for probable publication. One such method given by Hank Moed is “Source Normalised Impact Per Paper (SNIP)” which is the contextual measure of the impact of the journal in similar subjects. SCImago Journal Ranking (SJR) which measures the scientific influence of scholarly journals that accounts for both the number of citations received by a journal and the importance of the journals in that field., The Journal of Bone and Joint Surgery Series A has an SJR ranking 2.938 followed by the Plastic and Reconstructive Surgery Clinical (1.986) and Neurophysiology (1.581). Impact Per Publication (IPP) measures the ratio of citations in a year to scholarly papers published in the 3 previous years divided by the number of scholarly papers published in the same year. The IPP value for the Journal of Bone and Joint Surgery Series A is the highest among these journals. An expanding and shifting focus in recent CTS research has been witnessed which is analyzed based on the keywords used by the author in the article title [Table 6]. The direction of research trends in a given field can be traced by statistical analysis of keywords and title-words used to represent the key theme in the paper. Studies covering different subjects such as aerosol and solid waste research have exemplified this hypothesis. To measure the research progression in the field of CTS, the keywords which have been used the maximum number of times are “Carpal Tunnel Syndrome” (11900 articles), which has represented the central theme of the subject. “Female” was used in 6382 and “Male” in 5944 articles. It infers that the females suffer more than males. This is in line with the epidemiology report mentioning that the ratio of females suffering from CTS is higher than males.,, Middle-aged people are more affected than older-aged people. In the USA, workers aged 18–44 are more prone to CTS than those aged 45–64 or over. CTS is a neural disorder caused due to compression of the median nerve of the hand characterized by pain and numbness in the thumb, index finger, middle finger, and the thumb side of the ring finger. 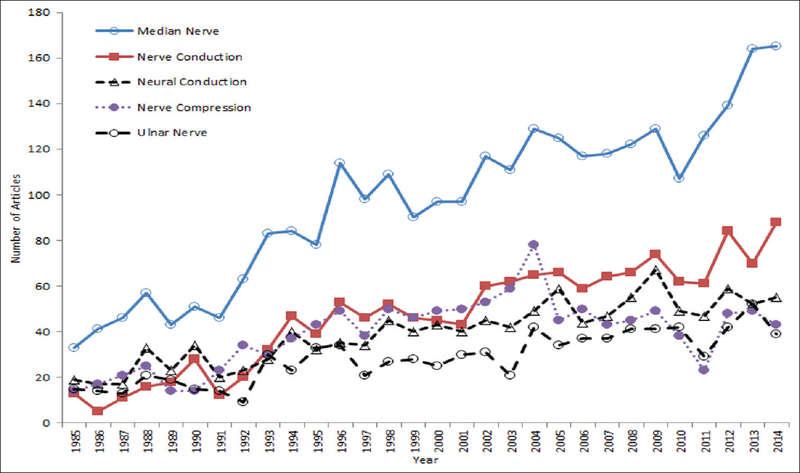 The top keywords designating neural disorder includes “median nerve” (3315 articles), “neural conduction” (1644 articles), “wrist” (1350 articles), “nerve compression” (1284 articles), and “nerve conduction” (1241 articles). The progression of the use of these keywords is shown in [Figure 3]. The clinical terms associated with CTS most frequently used were “clinical trials” (2224 articles), “electromyography” (1219 articles), “electrodiagnosis” (958 articles), “electrophysiology” (669 articles), “surgical decompression” (507 articles) and “echography” (582 articles). These key terms have been used to diagnose the disease and have been used in more than 500 articles., The other most frequently used keywords during the entire period were “ulnar nerve,” “hand,” “occupational disease,” “pathophysiology,” and “peripheral neuropathy” with an increasing rate in the ranking of frequency, and can be identified as CTS research hotspots [Figure 3]. A literature analysis through bibliometric investigation of articles on CTS was carried out for a period of 30 years. A total of 13187 articles were published that were indexed in the SCOPUS multidisciplinary database from 1982 to 2017. These articles were published in 11 different document types, where 67.31% were published as journal articles. These 13187 articles had accumulated 206266 citations till December 2017, wherein articles published in 1998 scored the highest number of citations. PC Amadio, from Mayo Clinic, was the most productive author with the highest citation and h-Index value. There were 10 articles which were most frequently cited. The USA was the most productive country with 37.14% of the global publication share. Papers published from the USA on CTS research accumulated the highest number of citations. India ranked 18th with 1.44% of the global publication share. “Journal of Hand Surgery American Volume” was the most productive journal which published 38.07% share of the total global publication on CTS. On the parameter of average citation per paper, articles published from Switzerland had the highest average measure. CTS is a neural disorder, so most of the keyword used by the authors, reflect the similar use of the terminology in the title of the article. The keyword analysis also reveals that middle-aged population is more prone to the CTS. The analysis further reveals that females have a higher incidence of occurrence than males. CTS is an occupational disease, as a large population around the globe working on computer or keyboards have been reported to be having CTS. This study might be beneficial for stockholders to connect, collaborate and discover potential remedies for the CTS cure. Hall CM. Publish and perish? Bibliometric analysis, journal ranking and the assessment of research quality in tourism. Tourism Manag 2011;32:16-27. Cucchetti A, Mazzotti F, Pellegrini S, Cescon M, Maroni L, Ercolani G, et al. The use of the Hirsch index in benchmarking hepatic surgery research. Am J Surg 2013;206:560-6. Molzahna AE, Clark AM. Quality matters: Metrics and benchmarking of academic nursing organizations. Nurse Educ Today 2015;35:9-11. Atroshi I, Gummesson C, Ornstein E, Johnsson R, Ranstam J. Carpal tunnel syndrome and keyboard use at work. Arthitis Rheum 2007;56:3620-5. Levine DW, Simmons BP, Koris MJ, Daltroy LH, Hohl GG, Fossel AH, et al. A self-administered questionnaire for the assessment of severity of symptoms and functional status in carpal tunnel syndrome. J Bone Joint Surg Am 1993;75:1585-92. Lewison G, Devey ME. Bibliometric methods for the evaluation of arthritis research. Rheumatology 1999;38:13-20. Glazier R, Fry J, Badley E. Arthritis and rheumatism are neglected health priorities: A bibliometric study. J Rheumatol 2001;28:706-11. Magid SK, Roberts TR, Javaheri M. What journal citations teach us about rheumatic diseases. Arthritis Rheum 2008;58:S153-9. Coronado RA, Wurtzel WA, Simon CB, Riddle DL, George SZ. Content and bibliometric analysis of articles published in the Journal of Orthopaedic and Sports Physical Therapy. J Orthop Sports Phys Ther 2011;41:920-31. Joyce CW, Joyce KM, Rahmani G, Carroll SM, Kelly JL, Regan PJ. Dupuytren's contracture: A bibliometric study of the most cited papers. Hand Surg 2015;20:402-9. Castro RCF. Journals in surgery and gastroenterology: Indexing in databases and bibliometric indicators. Acta Cir Bras 2006;21:122-32. Cassar Gheiti AJ, Downey RE, Byrne DP, Molony DC, Mulhall KJ. The 25 most cited articles in arthroscopic orthopaedic surgery. Arthroscopy 2012;28:548-64. Banaszkiewicz PA, Kader DF. Classic Papers in Orthopaedics 1st ed. Germany: Springer; 2014. Andersen JH, Thomsen JF, Overgaard E, Lassen CF, Brandt LP, Vilstrup I, et al. Computer use and carpal tunnel syndrome: A 1-year follow-up study. JAMA 2003;289:2963-9. Ali KM, Sathiyasekaran BW. Computer professionals and carpal tunnel syndrome (CTS). Int J Occup Saf Ergon 2006;12:319-25. Kiter E, Karatosun V, Günal I. Do orthopaedic journals provide high-quality evidence for clinical practice? Arch Orthop Trauma Surg 2003;123:82-5. Moraes VY, Belloti JC, Moraes FY, Galbiatti JA, Palácio EP, dos Santos JPG, et al. Hierarchy of evidence relating to hand surgery in Brazilian orthopedic journals. Sao Paulo Med J 2011;129:94-8. Kelly JC, Glynn RW, O'Briain DE, Felle P, McCabe JP. The 100 classic papers of orthopaedic surgery: A bibliometric analysis. J Bone Joint Surg Br 2010;92:1338-43. Kennedy C, O Sullivan P, Bilal M, Walsh A. Ireland's contribution to orthopaedic literature: A bibliometric analysis. Surgeon 2013;11:267-71. Gurbuz Y, Sgun TS, Ozaksar K. A bibliometric analysis of orthopedic publications originating from Turkey. Acta Orthop Traumatol Turc 2015;49:57-66. Ahn CS, Li RJ, Ahn BS, Kuo P, Bryant J, Day CS. Hand and wrist research productivity in journals with high impact factors: A 20-year analysis. J Hand Surg Eur 2012;37:275-83. Yang X. Stem cell transplantation for treating Duchenne muscular dystrophy: A Web of Science-based literature analysis. Neural Regen Res 2012;7:1744-51. Ram S. India's contribution on “Guillain-Barre syndrome”: Mapping of 40 years research. Neurol India 2013;61:375-82. Lin CL, Ho YS. A bibliometric analysis of publications on pluripotent stem cell research. Cell J 2015;17:59-70. Hirsch JE. An index to quantify an individual's scientific research output. PNAS 2005;102:16569-72. Stecco C, Aldegheri R. Historical review of carpal tunnel syndrome. Chir Organ Mov 2008;92:7-10. Moed HF. Measuring contextual citation impact of scientific journals. J Inform 2010;4:265-77. Falagas ME, Kouranos VD, Arencibia-Jorge R, Karageorgopoulos DE. Comparison of SCImago journal rank indicator with journal impact factor. FASEB J 2008;22:2623-8. Gonzalez-Pereira B, Guerrero-Bote VP, Felix M. A new approach to the metric of journals' scientific prestige: The SJR indicator. J Inform 2010;4:379-91. Waltman L, van Eck NJ, van Leeuwen TN, Visser MS. Some modifications to the SNIP journal impact indicator. J Informetrics 2013;7:272-85. Garfield E. KeyWords Plus: ISI's breakthrough retrieval method. Part 1. Expanding your searching power on Current Contents on Diskette. Curr Contents 1990;32:5-9. Xie S, Zhang J, Ho YS. 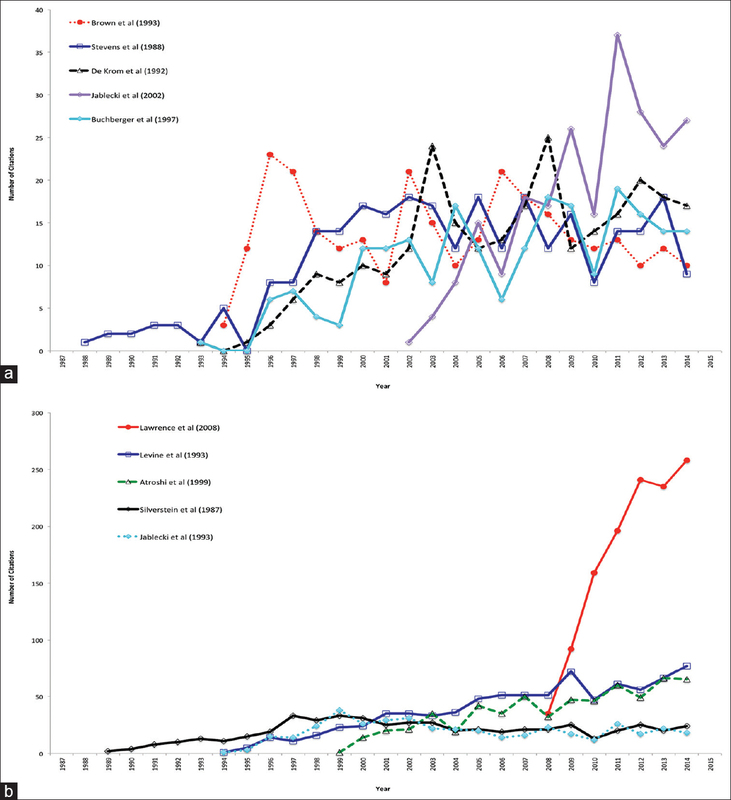 Assessment of world aerosol research trends by bibliometric analysis. Scientometrics 2008;77:113-30. Chen H, Jiang W, Yang Y, Yang Y, Man X. Global trends of municipal solid waste research from 1997 to 2014 using bibliometric analysis. J Air Waste Manag Assoc 2015;65:1161-70. Dieck GS, Kelsey JL. An epidemiologic study of the carpal tunnel syndrome in an adult female population. Prev Med 1985;14:63-9. McDiarmid M, Oliver M, Ruser J, Gucer P. Male and female rate differences in carpal tunnel syndrome injuries: Personal attributes or job tasks? Environ Res 2000;83:23-32. Ashworth NL. Carpal tunnel syndrome. BMJ Clin Evid 2014;2014:1114. Luckhaupt SE, Dahlhamer JM, Ward BW, Sweeney MH, Sestito JP, Calvert GM. Prevalence and work-relatedness of carpal tunnel syndrome in the working population, United States, 2010 National Health Interview Survey. Am J Ind Med 2013;56:615-24. Burton C, Chesterton LS, Davenport G. Diagnosing and managing carpal tunnel syndrome in primary care. Br J Gen Pract 2014;64:262-3. Goldfarb CA. The clinical practice guideline on carpal tunnel syndrome and workers' compensation. J Hand Surg 2016;41:723-5. Raissi GR, Ghazaei F, Forogh B, Madani SP, Daghaghzadeh A, Ahadi T. The effectiveness of radial extracorporeal shock waves for treatment of carpal tunnel syndrome: A randomized clinical trial. Ultrasound Med Biol 2016;43:S0301-5629.